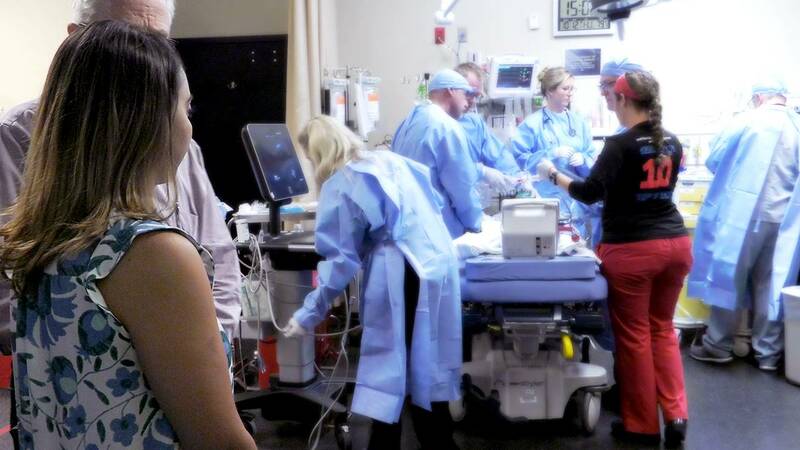 A mother looks on as the pediatric trauma team at Orlando Health Arnold Palmer Hospital for Children cares for her son. If a child is injured and required trauma care, should their parents be allowed in the room alongside the medical team? A recent national survey finds a vast majority of people think so. However, most hospitals haven't adopted policies such as this. Orlando Health Arnold Palmer Hospital for Children has and the benefits to physicians and families are plenty. Parents can help guide decisions and provide information, such as a child's medical history, while keeping the patient calm. A new national survey by Orlando Health Arnold Palmer Hospital for Children found that 90 percent of Americans think parents should be able to stay with their child during treatment of a life-threatening injury or condition. It's a policy that the hospital has had in place for years, but experts say this is still not the norm among pediatric trauma centers. "It's a common misconception among caregivers that parents will be a distraction in the trauma room, but I've actually found that it's a benefit that not only comforts the patients and parents, but helps guide the care that's given in those critical situations," said Donald Plumley, MD, a pediatric surgeon and medical director for pediatric trauma at Orlando Health Arnold Palmer Hospital. "Parents are a valuable resource for information on their child such as allergies, medical history and details on their injury or condition." Traditionally, parents are confined to a waiting area while their child is treated for a trauma, but experts at Orlando Health say more hospitals should allow parents to be present during treatment. At Arnold Palmer Hospital, parents are able to follow their child into the trauma room alongside the medical team and are accompanied by a dedicated staff member to support them and keep them informed. "I've been amazed at how well parents handle these tough situations when given the chance," said Plumley. "It helps tremendously if a child is agitated or scared, and oftentimes we're even able to forgo sedation or administer less pain medication because the parent is able to keep the child calm."